It was ok for the amount of money I spent. It was worth it. Just needs to have a fresher cleaner smell. I think there needs to be more security presence; the entire time I was there I didn't see a security officer. At times I didn't feel safe, because of how far my room was from the parking area. It is a dark area from the parking lot to the elevator. There was a slight foul odor as you enter the room, smelt like animals were there. The elevator needs to be renovated. Nice, clean, comfortable hotel in good location, great price, just what I was looking for on our trip to Orlando. Chips of the ceiling fell on my bed. The hotel was in a perfect location for restaurants, drug stores and entertainment. We didn't do the parks this time but instead visited with one of our foster children newly adopted family. It was a perfect setting, the room was large enough 8 of us to visit on the rainy days and the kiddy and adult pools were great on the sunny days. We will do it again soon. I am a senior but have a 10 years in a wheelchair. They accommodated so well that I would go again. Nothing, but it rained for 2 days and we still had fun in our large room. The pet-friendly La Quinta International Drive comprises 200 rooms economically priced and designed for families or couples on vacation. Items included with the room rate at this four-story hotel are a Bright Side breakfast buffet, high-speed Internet access, local telephone calls and parking. The hotel is a 20-minute drive from Orlandos International Airport and close to the Orange County Convention Center. Other area landmarks and attractions include numerous golf courses, the theme parks at Walt Disney World, Sea World Adventure, the Wet 'n Wild water park, Universal Studios, the Islands of Adventure amusement park, the Florida Citrus Bowl, Amway Arena, home of the Orlando Magic basketball team and shopping at the Florida Mall, Prime Outlet Shopping Mall, Fashion Square Mall and the Florida Mall. All the rooms have a work area with high-speed Internet access, telephone with voicemail, television with cable news and movie channels, on-command movies, video games, coffee maker, iron and ironing board, a radio and alarm clock and a hairdryer. 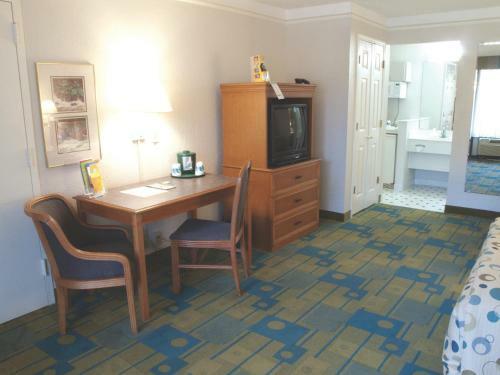 Some rooms have the added benefit of a microwave oven and refrigerator. This hotel has a large heated outdoor swimming pool, spa, sundeck, putting greens, arcade and a full service Tiki Bar. The complimentary breakfast is the only meal served. Restaurants close to the property include Bogards, a Perkins Family Restaurant, a Red Lobster and Unos Pizzeria. The 24-hour front desk has safe deposit boxes and information on the Orlando attractions and events. Other amenities include a guest laundry and ice and vending machines. 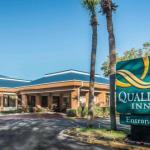 Visitors to Orlando say this La Quinta offers great value. There are plenty of things for younger members of the family to enjoy on the site before they venture out to see Mickey and his friends at Walt Disney World or have splaying fun at the nearby Wet n Wild water park. The rooms here are clean and spacious. Several families stayed here longer than they expected thanks to the affordable rates and said this would be their hotel of choice on future visits to Central Florida.